My son has been learning about farming in school this term with a focus on dairy farming. Being severely allergic to milk he’s not given an awful lot of thought to where it comes from so while admitting it has been weird he has enjoyed the topic. As a mother who flinches at the word milk I’ve found him enthusiastically singing about milkmen quite surreal. There have been ups and downs with the topic. The farming assembly we were invited along to was lots of fun and my son was the cutest little farmer I’ve ever seen but the class making butter without any thought to how scary it might be for a child with a milk allergy to be in a room of thirty children shaking jars of milk was a low point. I understand in this situation that I could not have provided a safe alternative (my son bless his heart thought maybe if we’d known about it he could have brought some of his own dairy free milk in to shake) but I’d have appreciated the opportunity to talk it through with him beforehand and offer reassurance that a clean jar with the lid on tight would not do him harm. Anyway this has very much been taken on board by the teachers so we’ve all learnt from it. 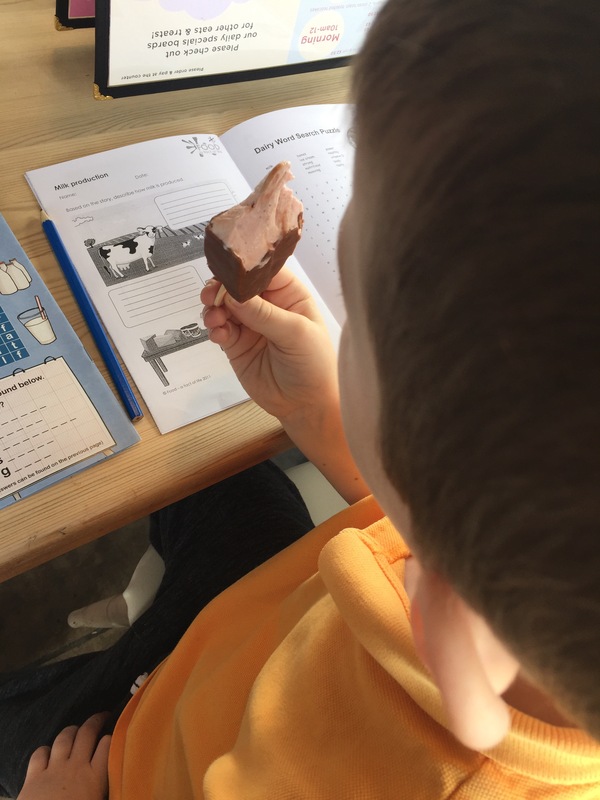 Getting to the point, as a reward for working so hard and to finish off the topic the teacher organised a trip to a local dairy farm where the children could see for themselves what they had been learning about in class and then have an ice cream in the ice cream parlour that has been built on the farm. So we had 29 of 30 children saying ‘yay ice cream’ and 1 saying ‘I’m not going’. Now this is a tricky one. While horrified at the thought of visiting somewhere so utterly drenched in milk protein I knew it would be an interesting trip and I was keen my son be included. The only reason he could give me for not going was ‘there is milk’. My first instinct is always to protect but he is going to be around allergens all his life, there is milk in Tesco and frankly there is milk in my fridge. We talked it through and I discussed the trip with his teacher and with significant reassurance and a promise I would go along and he could leave at any point if he was uncomfortable he agreed to go. At that point I kept imagining a hose coming loose and madly spraying us all with milk but I’m pleased to report my vivid imagination was nothing like the reality! Prior to the trip I phoned the ice cream parlour and then I emailed the farmer to give him more information about my son’s allergies and ask permission to store his safe ice cream in their freezer. The ice cream parlour does offer a soya ice cream and sorbets but they are made on the same premises using the same equipment and no matter how clean their kitchen is I just wasn’t comfortable with him eating their products. The farmer was super and gave me a full run down on what was planned for the visit and the risks involved. My son’s teacher also met with the farmer and assessed the risk involved in the visit. It was agreed he could go on the understanding I was with him at all times. I would carry emergency medication, school staff would carry a back up set (super cautious!) and I would bring my car so that if he became distressed or uncomfortable at any point he could leave. It’s really muddy. 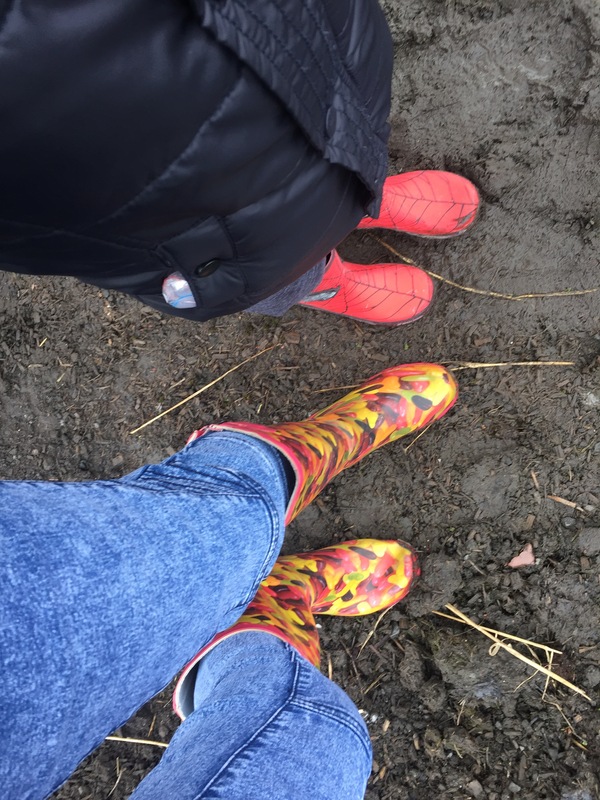 If they say wear wellies, wear wellies! You’ll be glad you did! Also they got us to step into foot baths on the way in and out of the farm which is way easier in wellies. 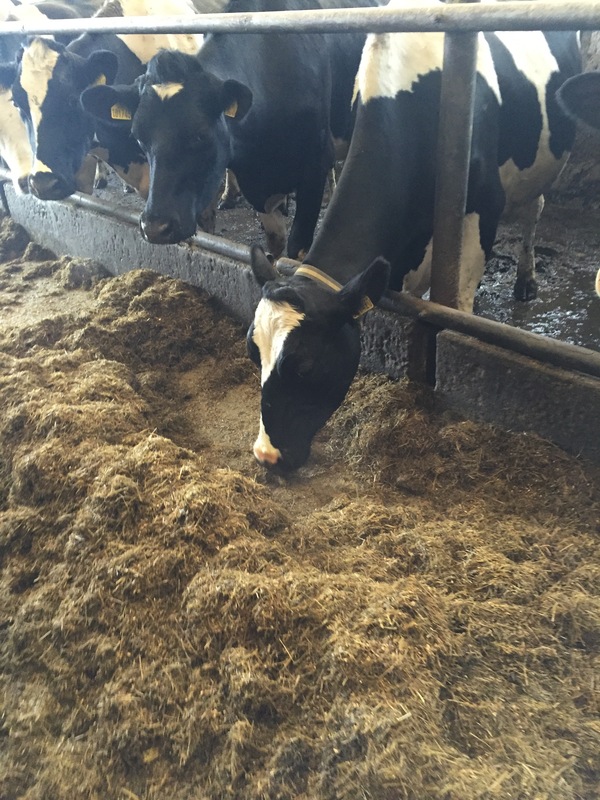 The cows are fed silage in the winter. This is grass mixed with other foodstuffs. On this farm it was mixed with barley, maize and soya. It is in heaps everywhere! As much as they clean everything there will be milk protein on surfaces/door handles/sinks. There will also be poo. Don’t lean on anything!! The hand washing facilities may also be where they wash out the milk pipes. Take hand wipes till you can get to a safer sink. Apart from the sneezing our visit went smoothly. He was a lot less anxious than I had anticipated although he did not enjoy being in the milking parlour. What I learnt from the visit- calves are born without immunity and need to get colostrum from their Mum’s as soon as possible after birth. They are then kept in weird little plastic pods until it’s safe for them to mix with the other cows. What my son learnt- cows peeing is really impressive, Swedish glacé make awesome choc ices and there is a really cool play park outside the ice cream parlour.